Love movies and television shows? Then you’ll love British Movies Tours. British Movie Tours is the premier provider of Film and TV location sightseeing tours in London and the UK. They operate bus, walking and small vehicle tours in various locations throughout the UK. Their tours feature locations from some of the biggest TV and film brands on both the small and big screen. Paddington Bear Tour of London. With all their tours educating, entertaining and appealing to visitors of all ages, nationalities and interests bringing movies and TV shows to life. Founded back in 2009 by Lewis Swan, British Movie Tours has quickly become one of the leading specialist tour operators in the UK. Click here to find out more about all their tours. Some community members of Love Pop Ups London had the pleasure of experiencing one of their most popular tours which is Harry Potter. Some of the Love Pop Ups community had the pleasure in attending the Harry Potter walking tour. Get a link to their blogs or read their reviews here. I am a Harry Potter fan ever since the first book came out, so jumped at the chance to go on the Walking Tour offered by Love Pop Ups London. Harry Potter walking tour – A great way to see the city especially for a Harry Potter fan. 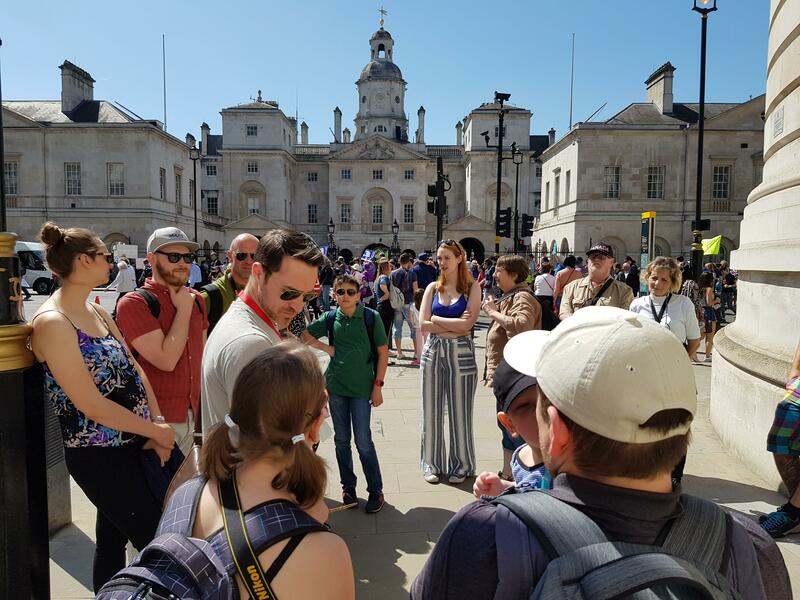 The tour is approx 2 hours long with a lot of walking involved but takes you past a lot of London’s best landmarks – the Shard, Millenium Bridge, St Paul’s, the Walkie Talkie and Parliament. On top of that some key film locations are featured including the Leaky Cauldron and Ministry of Magic muggle entrance. The tour guides were extremely knowledgeable, divulging some interesting facts about the filming, actors and costs involved with making the movies. He was also able to reference other movies as well as some interesting historical facts about certain landmarks. An interesting afternoon! Expelliarmus! Little joke amongst the various Harry Potter tour guides (silly but fun to watch in action) You ll understand once you do the tour! Quite an interesting tour, while none of the locations were news to me it was still interesting to learn more about the history of the buildings, the tricks/effects used by the studios to make the scenes/areas look a certain way. I would consider myself a Harry Potter fan having read all the books and watched all the movies. However, I watched most of the movies before I moved to London so some of the locations were news to me. I didn’t know that Diagon Alley was Leadenhall Market for example. I thought that everything was recreated in the studio as I had been to the WB studio tour and there was a Diagon Alley there. It was also interesting to have some background of how certain scenes were shot or modified for the movie. If you’re a Harry Potter fan, please add it on the list of things to do. There is a lot of walking outdoors so preferably do it on a sunny day (if you can).